Got a big week coming up in my teaching schedule-- the 2D classes at both of my schools will be starting woodcut projects. With bad weather coming into the area and possibly no other time to do it, I went up to the Studio early this afternoon to cut up a bunch of the wood I bought recently. First, used my ancient scrolling saw to cut my 2'x4' panels into 36 smaller pieces of 8"x6" each. (I only need 28 for the classes, but it's good to have a few extras for demos and such.) The blade is designed to leave the top free of splinters, but no such luck on the back sides, so I used sandpaper to clear those off, then set them aside. I get itchy when I'm not actively working on something, so I next cut another piece of wood, this one large enough for a 10"x7" Everyman print. With pencil I laid out the exterior borders, then applied wood filler. 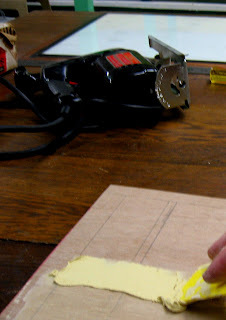 As shown in the photo, I use a plastic putty knife to first spread thick along the grain, then pull the knife on its edge to scrape it back up again, leaving just a thin layer in the cracks. Let it dry, and reapply to any areas that I missed the first time. I let it completely dry again, then take it outside and lightly sand with 220 sandpaper. The result is a glass-smooth surface that is much easier to draw on (and erase), less grain to break up the solid black areas, and less splintering while cutting. I redrew the faint pencil lines, then called it a day, getting home just before the snow. I'm still working out some ideas for this next saint, so it may be a while before I'm back working on this block, but I'll be ready when the time comes. One of those PCNJ shows I referred to a few days ago is called Process Exposed, which will show finished prints, as well as the original matrix (block, plate, etc), sketches, state proofs-- all the stuff that is part of the creative process. It's the kind of thing I do with this blog, but for this show they want people who aren't the regular crowd. Got a few of my Jersey friends in touch with our gallery coordinator, so now I'm extending outward to the midwest. John Siblik came to mind, partly from having seen him just last weekend, but also because of his habit of thoroughly working out his ideas with sketches, models, and the like. 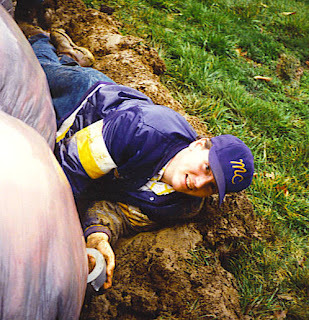 For example, before building and installing his Farting Machine on campus in 1994 (shown above) he started with a written proposal, sketches, and a maquette (model). He brings the same effort to his 2D work and that includes some nice prints I've seen in recent years. So I called him yesterday, told him about the show, and he's excited by the idea. Today I sent his information to our gallery coordinator, and if it all works out John will be part of the show in May. I'll keep you posted. My involvement at the Printmaking Council is keeping me busy this week. I've been on the Exhibition Committee there for quite a while- I was invited to join when I proposed an exhibition for the gallery (the Reading Blake group folio that I organized with Tom Huck, which was one of the earliest group involvements of some of the Outlaw Printmakers and did get shown there in 1999) and they figured anyone motivated enough to actually submit a proposal should be on the committee. On this committee we come up with ideas for exhibitions, evaluate proposals, schedule shows, install work, prepare for receptions, and other related tasks. Besides getting to help influence the direction of the gallery, the experience has probably helped me in learning how to prepare for my own exhibitions. When I first started we had a lot of regular meetings at the gallery, but these days we do more of our business by e-mail. This has been one of those busy e-mail weeks, addressing multiple needs- finding artists for a curated show coming up in May, suggesting themes for a juried show in the fall, and providing an opinion about another curated show for a grant application. I provided some input on the latter two, and have been devoting time to contacting artists I know about the first item. Another Print Council item this week- a letter from our new director. Haven't met her yet, but I will sooner or later. The letter mentions an upcoming fundraiser in the form of an auction to benefit our Roving Press community programs, and a request for a donation of a piece of artwork for the auction. I don't know if this letter went to all the membership, or if I'm being tapped because of my other position with the Council, a member of the Advisory Board. This position has few demands, just occasionally providing opinions on various Council business. I'll have to contact the director to find out more details, but I expect I'll provide something- it's the kind of thing I do from time to time. Although I don't have a new project ready to start, I figured today was a good day to pick up some new wood. The weather was nice, had nowhere I had to be right away, and I was not far from a home center. So after work I picked up two 2'x4' panels of 1/4" lauan plywood. Some of this I may use, but most of it I'll be cutting into small pieces to distribute to the students in my 2D classes, who will all be starting a woodcut project in a few weeks. Normally I'd go right to the Studio to drop it off, but I know that at that time the building is choked with dance students and I won't find any nearby parking, so I just brought it all home for now. I went out in the evening to participate in a meeting at the BAC regarding the upcoming annual juried show. Since I have a lot of exhibition related experience I figured I could contribute, and I think I did. In between, in honor of today being Mardi Gras, I ate a mountain of jambalaya and listened to highlights from my collection of cajun and zydeco music. This may not have much to do with art, but here at Arrabbiata, we appreciate spicy foods from all cultures. Today was the annual Belmar Art Walk, an event that puts art in various downtown locations (some galleries, but also stores, restaurants, etc) with some scheduled events along the way. I guess it's partly about getting people on Main Street in winter, but it's also an opportunity to promote local artists and arts in general. Now that the Belmar Art Council has our new building in shape, we arranged to be an open location and put on a reception as the last stop of the day. The Members' Salon show is still up, and there was a 3 piece jazz combo in our little stage alcove to provide live music. A good crowd showed up, at least 30 or 40 people during the time I was there. I talked about my art and process with some people, handed out a few postcards. I'm still pretty exhausted from my NYC trip, so I didn't hang on until the end. As mentioned in the previous post, my time in NYC included seeing an amazing show with Suzanne at the Met called Glitter and Doom, which was all portrait paintings and drawings from Germany's Weimar years. Over 100 works, about half from Otto Dix, and also cool stuff from George Grosz, Max Beckmann, and several other artists. Up top is a preparatory drawing by Dix for his triptych painting Metropolis. As mounted, the drawing triptych is a monumental 6 feet high and about 10 feet wide, a scale that allows for incredible detail and impact. Unfortunately this show closes on Feb 19, so if you want to see it you better get there soon. I wouldn't say that Dix and his contemporaries are direct influences, but I've long felt a kinship for these guys. Maybe a decade or so ago I gave some thought to where my art fits in to the history of art, mostly to make it easier to describe to people what my art is like. The most common comparisons that I hear are German Expressionism and Pop Art. These two movements are definitely influences, but I don't think either is a truly accurate classification for what I do. My art is firmly rooted in Modernism, so I started looking through 20th century history. In the end, what I seemed to have the most in common with (especially with my portrait prints) is the movement in 1920's Germany called Neue Sachlichkeit (New Objectivity). My subjects are not the lowlife society fringe that Dix specialized in, but my approach is a kind of psychological realism that is common to the work in this show. Seeing all these portrait paintings and drawings makes me more excited than ever to start that portrait piece I had been planning, but still lacking a model, that will have to wait. Lack of recent updates can be attributed to a variety of factors, including work and the Valentine's Day blizzard, but the last few days have been occupied with going up to the city to see some of my fellow SIU grads from the MFA program of the mid 90's. These are all people I've kept in touch with through letters, phone and e-mail, but hadn't seen since I left Carbondale in 1995. However, the CAA was in town this week, and the SIU faculty traditionally organize a little get together, and I knew that some of my old friends (all painters who also did some prints) would be there. So I took the train up early yesterday and met up with Suzanne C. Thomas (Oklahoma) and we headed up to the amazing Glitter and Doom show at the Met. Then a 6 train back downtown to the alumni gathering where I ran into John Lustig (formerly Chicago, now Terre Haute) by the elevator banks, and we all went up together to find Armen Sarrafian (Chicago) and John Siblik (Iowa) and a bathtub full of iced-down beer. Also got to chat with some of the faculty from our time, Ed Shay and Harris Deller, and current grad Diana Baumbach, who remembered me from when she was an undergrad at Wash U and Tom Huck had me out to St Louis (2003) to work on a print and talk to his classes. Later at another event, Siblik introduced me to Sandra Murchison, who I had been in phone/e-mail contact with regarding an exhibition of the School Days group folio at her school in Mississippi a while back. Then the gang headed out for deli and drinking. Other than the food being better and beer a lot more expensive, it was almost like no time had passed, instead of the 12 or 13 years that it has been since I've seen all these people. Had a really great time. Found a place to crash last night, and after stuffing myself at a diner this morning, took the train back home. So what does all this have to do with the Studio? Well, Studio Arrabbiata has its roots in those Carbondale days, back when the 5 of us all had individual studios just steps away from each other in the Good Luck Glove Factory- not unlike my current location, a space converted to art studios from its previous use. Some semesters you might only meet with your faculty a few times, so interaction with the other grads was very important. 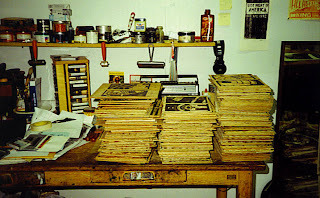 The photo above shows the table where I did most of my cutting, including those piles of blocks for the 366 print Fourth of July series. It was there in Glove studio 203E that I evolved my drawing/cutting style and my way of developing ideas. It was there that I started the Everyman series, the latest of which is the St Budoc print that you can see developing throughout the January archives of this blog. Without all those experiences, Studio Arrabbiata might not exist today. Not a bad day, just one where I didn't get as much done as I could have. Set out in the afternoon, first stop the photo store in Belmar to see if my slide dupes were ready. I still don't know, because it was closed, maybe 5 minutes before I got there. Drove a few blocks to the Boatworks to see what was going on there. There were a couple of BAC members there, so I stopped in and we had fun talking about stuff. Kevin and I spent some time talking about my Everyman series (he'd seen most of them last year at Landmark Books) . There's a good chance that my next print will be a new saint print--more on that later. From there I went up to the Studio. The plan was to mostly drop off/pick up, but I brought a sketchbook in case I felt like working on some ideas. That proved impossible as it turned out Molly was hosting a birthday party for her two daughters and several small excitable children. 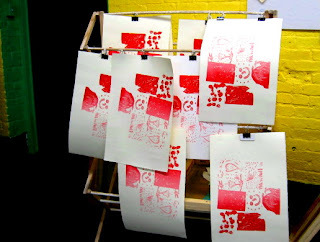 Earlier she had the kids do small drawings, which she had arranged into a composition and burned onto a silkscreen. I was there to see her print a bunch of these on paper (see above) and assorted tiny t-shirts for the kids. The resulting image is not my style, but was at least as good as a lot of stuff you'll find on gallery walls. I did accomplish my minimum goals-- dropped off some print supplies and reference material and picked up a wooden tripod easel I'll need for class this week--and I got some free pizza and raspberry sherbet to boot. So I'll sketch tomorrow. Just got the prospectus for the 51st Annual Juried Print Exhibition at the Hunterdon Museum in Clinton, NJ. In recent years I've cut back on entering a lot of juried shows, but this is one I'll probably send in. I had been aware of this show for a few years, but only entered for the first time when I received an unsolicited prospectus in 2002. Sent in an entry and the juror chose Delay not the fulfillment of a vow to God for the show. Turned out to be a nice show, and my print even was discussed in the NY Times review of the show. Additionally, then exhibition curator Donna Gustafson selected mine to be part of a smaller travelling version. Sent in again in 2003 and had another accepted, my September 11 piece. The curator was again impressed with my contribution and was open to the idea of hosting a solo show of my work, so I sent in a proposal. The next year I moved and called her to update my contact info. Maybe it was good to remind her that I was interested, because a few weeks later she offered me a slot that opened up for later in the summer, a show featuring my Scenes from the Grand Opening series and an assortment of other work. Great space, had lots of viewers, tons of publicity. Because of my good experiences there (as well as being a chance to see a lot of my NJ print world friends) I have continued to enter the juried show. However, my friendly curator has moved on, and the last few times the various jurors declined all my entries. I figure it's worth another try- I have some good recent work that hasn't been seen widely yet (or at all) and not much else lined up for the near future. 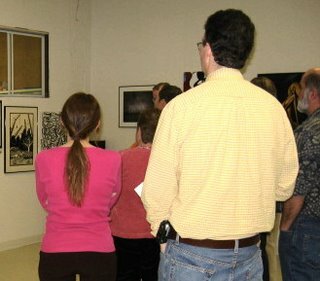 Tonight was the Belmar Arts Council's 1st Member's Salon, a chance for some of the participants in the current exhibition to see the show and discuss their work with the crowd. The building is really coming together, with a new coat of paint on the cement floor and cove moldings along the base of the walls. After the general meeting in the back room, we reconvened in the front room gallery to see the show. In no particular order we took turns talking about our artwork. You can see my piece Moving Day all the way on the left. About 2 dozen people were in attendance, not bad for a very cold night. The plan is to have the gallery open weekends through the end of February, including a evening reception during the Belmar ArtWalk on Feb 18. Back on Jan 30 I wrote about coming up with the next project and the possibility of a large portrait/figure print, pending the decision of my intended subject. Well I asked her again today and she has officially decided not to participate. Since I have no one else in mind right now to pose for the piece, for the moment it is on hold. If I can find someone in the future I'll try it then, but meanwhile I'm a little disappointed. Hey, not all these entries are going to be good news. So now I have to come up with a new next project. I'll give it some thought over the next few days, and decide on what idea I'm going to focus on. More news to follow. Pretty much all my time since the last entry has been occupied with teaching and tv sports. And it's all been bookended by moving my old studio chair around from one end of the state to the other. I first got this chair in Carbondale, left in my studio by the previous occupant. A bit rickety, with an unattached wooden seat that didn't quite span the seat frame, so I cut a piece of scrap plywood to slide in between. Brought it back to NJ where it was my desk chair for several years. Now it's back fulfilling its old function at Studio Arrabbiata. Meanwhile, it regularly makes appearances in my classes. Last Wednesday it was in my figure class, where the removable seat makes it ideal for posing the skeleton. (they tend to slide out of regular chairs) Today I had my intro class drawing all the negative spaces in it. In future weeks it will be paired with my philodendron as a drawing prop in my 2D classes. After today's appearance in North Jersey, I dropped it off at the Studio on the way home. 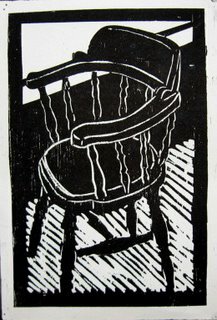 Since I didn't have my camera with me, I'm posting a woodcut image of it from my Fourth of July series, where it represented June 29.